Sorry... the 2017 Lexus IS 200t is no longer being sold as new. The 2017 Lexus IS 200t is the entry-level, luxury compact sedan in the lineup. It competes with the BMW 330, Mercedes-Benz C-Class C 300, and Audi A4. This year, it gains a midcycle refresh that includes revisions to its exterior and interior. Updates to the IS 200t are most apparent at the front-end, which has a new headlight design and menacing lower air vents. The rear fascia had also been slightly revised and adapted to fit the new, molded dual pipe exhaust system. The F Sport also shares more similar styling with the base model. The F Sport’s spindle grille retains its unique mesh pattern, but triangular slits at the lower fascia subtly indicate its more aggressive nature. Standard features for the IS 200t include HID headlights, front fog lights, heated side mirrors with turn signal indicators, remote trunk release, and 17-inch wheels. Sport-tuned suspension, a rear spoiler, and larger 18-inch alloy wheels are also available. Under the hood, the IS 200t is powered by a standard 241-hp, turbocharged 2.0-liter 4-cylinder engine mated to an 8-speed automatic transmission and rear-wheel drive (RWD). Fuel economy for the IS 200t is an EPA-estimated 22/33 mpg city/highway. Inside, the IS 200t offers a premium NuLuxe leatherette interior with front bucket seats and a 60/40-split folding rear seat. The steering wheel controls and cupholders have been revised for improved ergonomics. The center stack features a standard 7-inch display audio system, Bluetooth connectivity for phone and audio, and a dual USB port. 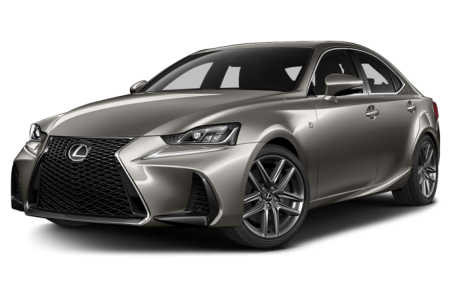 It can be upgraded to the Lexus Enform multimedia system that has a larger 10.3-inch display, an integrated navigation system, an app suite, voice command recognition, and a Mark Levinson premium audio system. Standard features include dual-zone automatic climate control, power front seats, and remote keyless entry. Leather upholstery with contrast stitching, a power tilt/telescoping steering wheel, heated/ventilated seats, a memory seat, and a heated steering wheel are available as well. The Lexus IS 200t earned a full 5-star overall crash test safety rating from the NHTSA. 10 air bags, antilock brakes, and an electronic stability system come standard. Free for the first year is the Lexus Enform Safety Connect package that includes automatic collision notification, stolen vehicle location, an emergency assist button, and roadside assistance. A backup camera, front and rear park assist, a pre-collision system, a blindspot monitoring system, rear cross-traffic alert, and lane departure warning are available as well.